French Emblems: Emblem: L'immortelle gloire acquise par labeur. L’immortelle gloire acquise par labeur. D’age en age il vivra perpetuellement. 1. Antoine Perrenot, Cardinal de Granvelle: Chief Minister of Charles V and Philip II in the Netherlands, his harsh rule contributed to the revolt of the Dutch against Spanish rule. He was Bishop of Arras from 1540, chief minister from 1550, Archbishop of Malines (Mechelen) from 1560, and Cardinal from 1561. 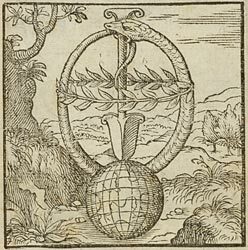 In March 1564 popular unrest forced him to leave the Low Countries, so it is interesting to see that Junius still dedicated an emblem to him in 1565. Perhaps this was a political move, as Granvelle’s exile was not meant to be permanent at the time - though it soon turned out to be. He slowly regained power in Spain itself, where he died in 1586.